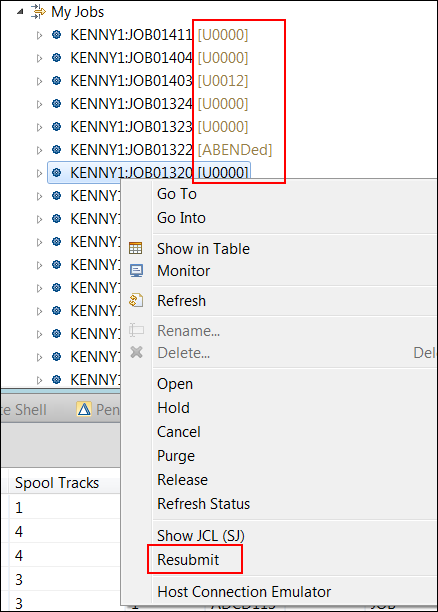 The JES now shows the return code of completed jobs. This saves you significant time in tracking down which job completed, which abended, and which had other issues. You will see this in the JES filters. Also for JES, you can now resubmit directly from the context menu. Ordinarily you would just open the JCL, edit, and resubmit, or do a SJ then submit from the open JCL. This should save a couple of clicks. You will also notice that Active jobs display at the top of the filter. If you are just now hearing about version 9.0 of RDz, then you'll be happy to hear about the new JCL Editor. This editor acts much like the Java and COBOL editors, offering features such as content assist, code formatting, and code collapsing. Opening file references in open, view, and browse modes. Opening include members by using the JCLLIB statement handling of the JCL parser. Searching data sets listed in a JCLLIB statement when locating procedures. 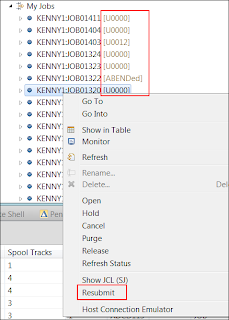 Displaying the open actions in the editor menu. Hover information for INCLUDE statements.